All new pages from May 2018 will receive a free SUDEP Action pin badge automatically by post. 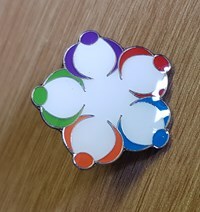 The badge image represents the five bereaved women who started the charity and all of the dedicated people who continue to support SUDEP Action to make every epilepsy death count. The linked arms are a simple but powerful expression of our unending support for the bereaved, dedication to raising awareness of epilepsy risks, and tacking all epilepsy related deaths. If you set up a page prior to May 2018 and would like a free badge please get in touch. You can call us on 01235 772850 or email fundraising@sudep.org.